Nita has worked for 30+ years in varying leadership roles in the Corporate Sector. She was formerly CEO at NewsCorp VCCircle, COO at Godfrey Phillips India Ltd and VP at DDB Mudra Communications Ltd. She has extensive work experience in advertising, communication, research, marketing, CSR, new product, business development, business operations, social media and has been involved in the social sector building brands and projects since 2005. 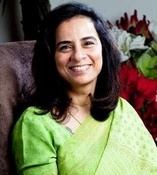 Nita is currently the Director for Muskaan Social Consulting Services, a unique firm that offers leadership, team building trainings and CSR projects for the corporate sector. Muskaan is India’s largest NGO for Intellectual Disability and Nita has served on the Board of Muskaan since 2008. She is on the Advisory council of CERCA IIT D- Centre of Excellence For Research in clean air, her responsibility includes communication programs and media relations for a variety of stakeholders. Nita is an alumnus of IIM A and Harvard Business School and speaks at key leadership forums and business schools across India on management topics, the importance of gender diversity and the role of women in building the economy of our country. Nita has been recognized in the Top 50 influential Marketing Women in India and is among Top 22 Women Angel Investors in India at Indian Angel’s Network. She is a core member of the UNGC Gender Equality Panel, active member with FICCI Women on Corporate Boards and a lifetime member of G100 Network in New York.